A heavily cropped shot of the Allen's Hummingbird male(First year) from yesterday. Maybe he thought the camera lens was my nectar feeding apparatus. I definitely felt his gaze. You can pick out the individual barbs on his feathers. This is just an amazing capture, great job. Freaking amazing. I hope one day to get a hummingbird in flight like this. So lovely! 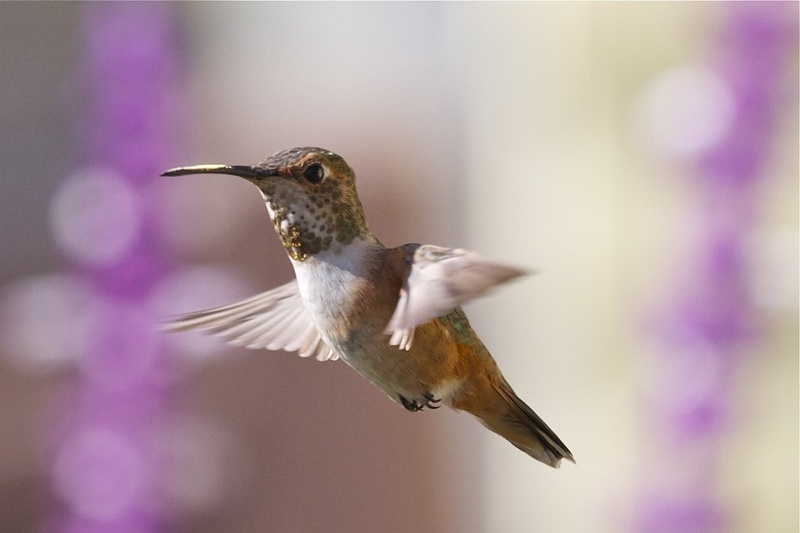 Your hummingbird pictures are wonderful. You must be an extremely patient photographer. how amazing! still wings and all! I absolutely love your hummingbird shots. They are amazing. Your Hummingbird shots are awesome. fabulous capture..
Nicely framed between the stalks of sage. This is a really great shot! Nice job! Definitely a fav! this is such an amazing shot great job ! Nice contrast of the blur of his wing tip and the still clarity of his body. The background looks cool as well. This rocks. How the heck did you get this close? (aside from the crop) You must have a mega-lens. Amazing. They are so hard to "catch". @clarissajohal I used a 70-200 zoom, hand held with image stabilization. Had to manual focus since the AF was hunting all over the place with the busy background. I was about 2 meters away, lots of fun trying to track him. Thanks to all for the kind comments! Love this pic, wonderful capture! This is a favourite to me! Wow! Definitely a fav. This is a fantastic capture. Beautiful shot. Love seeing his feet tucked in. Greatly captured! Stunning detail you got here, love the background colours. Amazing capture, once again, Robert! Oh wow....how do you capture things like this with such clarity and detail, it is simply amazing!!!!!!! Yep. This is the one I want for my bucket. :) Beautiful! your hummingbird photos are beautiful. I've chosen this picture for my project!